Okay, so about this time a few years ago, Christmas was over and I’d eaten my entire body weight in sugar cookies. What to do before the sugar wore off? Make an ambitious list of New Year’s resolutions of course! Wow, that’s 6 resolutions that I’d come up with; it sounded a little bit daunting. I questioned how I was going to do all these things over the next year. There’s a myriad of organizations to volunteer for in San Antonio and so many new and up and coming areas to explore. I asked a couple of my friends if they had any suggestions. One very smart friend suggested that I check out the Junior League of San Antonio. After reading about the organization online at jlsa.org I decided to fill out an application- I had nothing to lose! 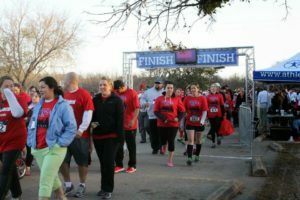 I read all about JLSA’s Resolve for a Better SA 5K and the Let’s Go San Antonio Program; it looked like I could get two of my resolutions checked off my list right away especially because the 5k is at the end of January… I found my running shoes fast! There’s still time to register for the race in 2015! Let’s Go San Antonio seemed like a really great way to give back to the city and to pick up some healthy eating habits too. I’m slowly I can’t eat mac n’ cheese forever. (The key is moderation.) And I loved the fact that Let’s Go San Antonio is a city wide initiative to help children develop healthier eating habits. I also was ready to get organized and when I learned more about the Junior League’s partnership with Goodwill for donating I thought it was awesome that the donations basically counted double: support Goodwill’s mission of changing lives through the power of work and earn gift cards for JLSA to give to our community partners! One resolution kept sticking out in my mind-volunteering. I wanted to be a part of an organization that had rich history in my city, part of an organization that could help me development myself as a better leader, an organization that would guide me. The Junior League of San Antonio seemed like a great fit! I knew a couple women in the organization already and both spoke very highly about how the Junior League helped them to grow as women and as leaders, and honestly I had been looking for an organization just like this since I graduated college. I truly felt like JLSA could really help me accomplish my New Year’s Resolutions. The single biggest way I could accomplish all of my resolutions was to join JLSA. So I did and you can too! If you’re interested in joining the Junior League of San Antonio you can fill out an application online at jlsa.org. There will also be an information session on Tuesday, January 13th at 5:30 pm at the Bright Shawl prior to the January General Membership Meeting.